It's time to link up with Farley! Christmas in 2nd grade is always an adventure! I have been teaching for 15 years and have my set traditions, but I also throw in some new fun every year to spice things up! Every year, I always have my students watch the traditional movies like Rudolph the Red Nosed Reindeer. This year my school decided to have Polar Express Day! The kids loved it! My teammate and I loved it! (We actually made it more like a Polar Express week!) Here are my students, in their PJs, waiting for the movie to start. Each year, it has been a tradition to make our yearly ornaments that my students take home to place on their trees. My students create a felt Christmas tree and a mock stained glass ornament that can be hung on the tree on in a window. I cut trees out of green felt and hot glue ribbon to the top. I also hot glue a popsicle stick to it and add each child's name and year with a sharpie marker. I always set up my ornament stations during one of our Christmas movies and have three or four students create their ornaments at a time. I use paper plates to put out assorted shiny little ornaments and sequins that can be found at any craft store. I actually purchased a large bag fifteen years ago and am still using the same bag! A bag of these will go a long way! I have assorted colors of glitter and each child will need regular glue. When the children come to me, I add glue and their choice of glitter to the tree. I use old cool whip containers for this. And then the decorating begins! 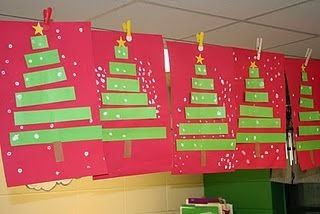 The students place their trees on a table to dry overnight and then they go home in their ornament bag for Holiday Break. Their ornament bag is usually a white lunch bag with their name on it. I glue a cute cut-out tree or ornament to it before it goes home. Any small goodies they may receive also gets placed in the bag. The mock stained glass ornaments are printed on old overhead sheets. Luckily, my school still has boxes of the old sheets so I am able to get these for free. I copy the pattern onto the sheets putting the sheets through the bypass tray on the copy machine. Then I lay them on the table for the children to choose one. I have old patterns I have been using for fifteen years, but this year I was able to introduce some new patterns thanks to From the Pond who has a product called Christmas Window Art. So my kids could choose from both. Once they choose, your kids will need sharpie markers to draw with. When complete the teacher just cuts them out, punches a hole, and adds some yarn or ribbon. They look awesome hung on a tree with the Christmas lights behind them! Hello everyone! 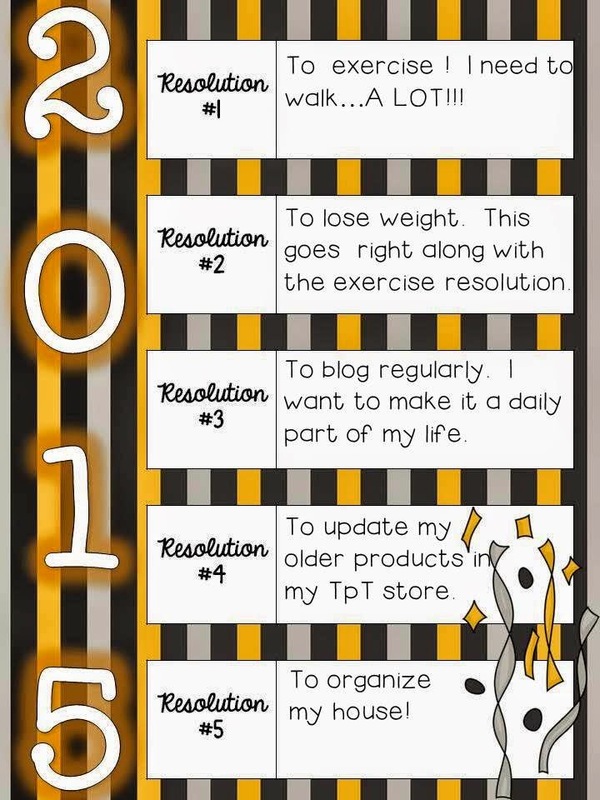 I am linking up with Jessica over at The 2nd Grade Nest to talk about this year's resolutions. I achieved my goal of receiving my masters degree and also an add-on license in gifted education. But my whole goal in doing so is to move on to another position and move out of the classroom. That is still my goal. I've been working on this goal for some time. I will get there!! I want to exercise more. I need to walk regularly. In my younger years, I was a runner. I wish I hadn't given that up. One of my biggest regrets is that I have never learned to played a musical instrument. I'm thinking of taking violin lessons. I would love to visit the west coast and see the Pacific Ocean. I have never seen it and would love to! 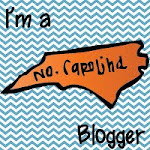 Head on over and link up! 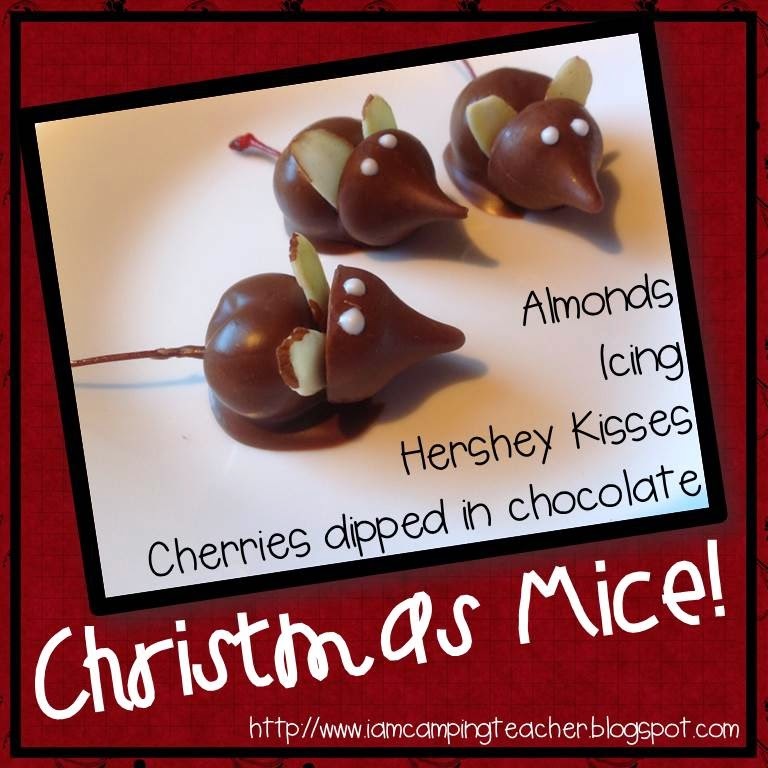 Christmas mice are really easy to make! I prefer to purchase the good chocolate that candy makers use, but some people just melt chocolate bars. It is a bit more expensive, but tastes so much better! You can purchase different types and brands at candy supply stores. Make sure you buy cherries that still have the stems on them. Dip the cherries in the melted chocolate and lay on wax paper. You must work fast because the chocolate hardens quickly. 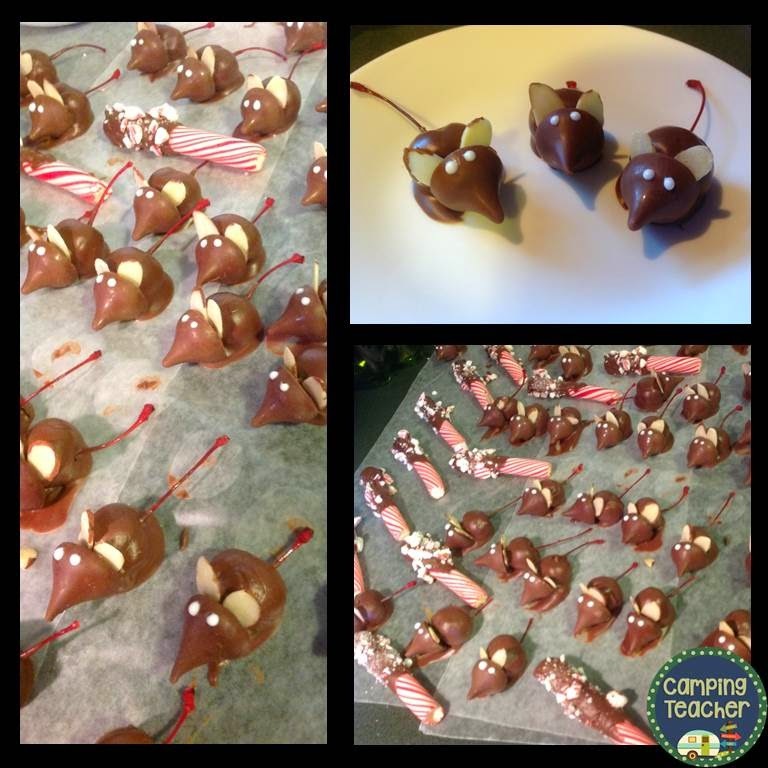 Add a Hershey Kiss to the front and two slivers of almonds for ears. 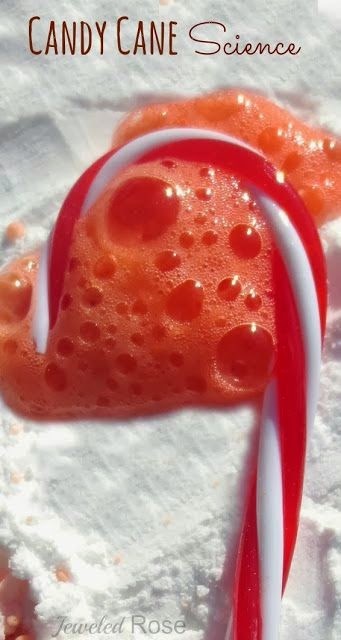 After it all hardens, I use a small tube of icing (sold at any grocery store) and add two white or pink eyes. And that's all there is too it! It is always a favorite at parties or added to a plate of cookies that I give as a gift. Enjoy! 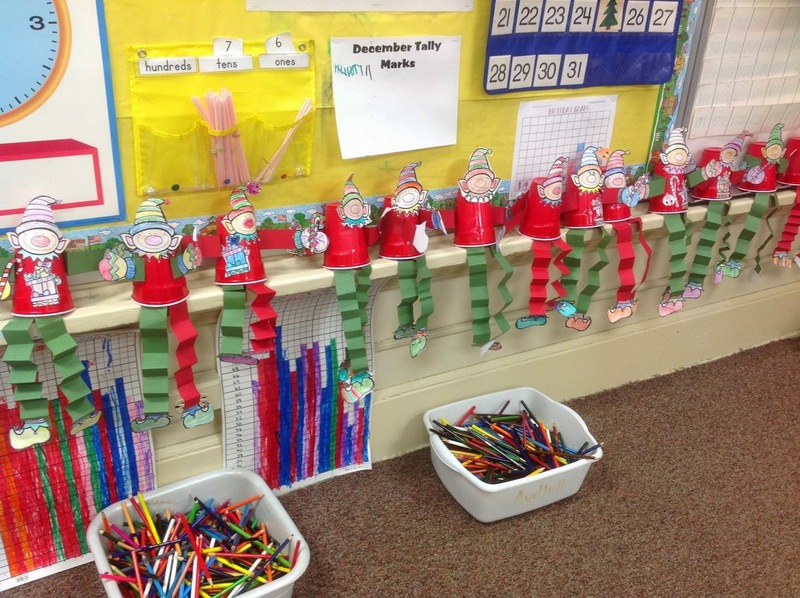 Today, my class made the cutest elves!!! 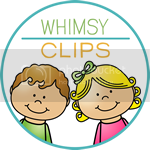 This activity came from Jennifer Drake's store on TpT and my kids loved it! 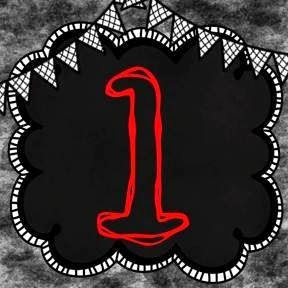 Tomorrow we will be officially naming our elves and filling out our official certificates. I will definitely have my class make this next year. They are really into color pencils so they spent a great deal of time coloring their elves today. 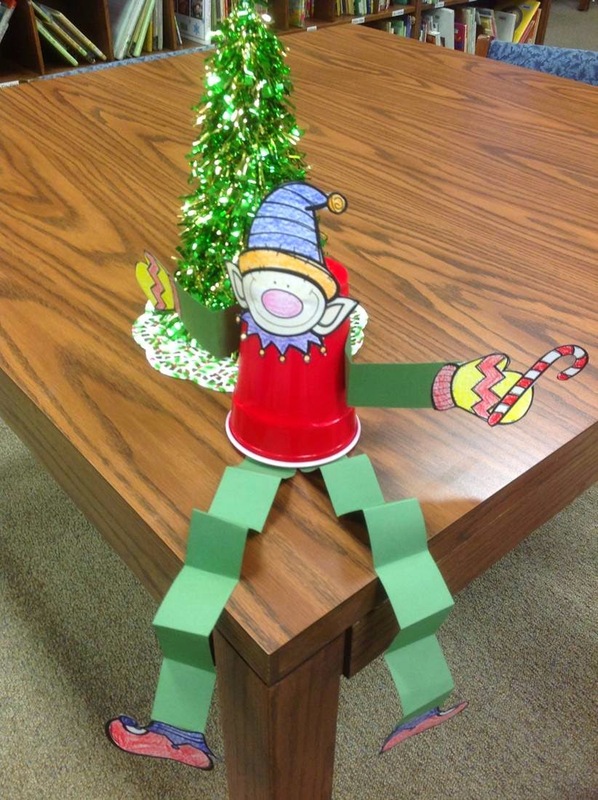 I didn't realize that my students didn't know how to make the legs with the accordion fold. I remember folding fans, in this way, when I was a child. I showed them how and I think they did a really good job (a few had a little bit of trouble). Thank you Jennifer for a fun activity! School Systems are Expecting Infants to Walk! I was just reading an article called A Very Scary Headline About Kindergarteners. It is an excellent article about how school systems are forcing children to learn concepts and skills at earlier and earlier age levels. For teachers like me, this is not news. We have been seeing this trend occurring over many years. It has bothered us, concerned us, and just downright scared us to death! I have compared it, many times, to expecting an infant to walk. If the infant can't, then there must be something wrong with the child...at least that is how our school systems are treating our students. Some students can keep up with the demands that are placed upon them. Usually, these are the higher achieving students. The ones that rarely struggle. They read early. Learn math early. And they probably were even those infants that were crawling and walking early. Good for them! And these children should be allowed to excel. They should be given opportunities for enrichment and gifted programs or whatever they need. But what about the average child? Or the low achieving child? Should they be forced to keep up? The article focused on kindergarteners. I know a little about that. I spent three years of my career teaching kindergarten. It was a completely different experience than the kindergarten I experienced back in 1974. A completely different world. There was no housekeeping center or block center. My principal, at that time, would have never allowed me to let the children play. That would have been blasphemy! Instead, I was attempting to teach these little 5 year old's to read at an accelerated rate while at the same time trying to train them to stand in a line and walk in that same line, use the bathroom correctly by themselves, eat and throw their lunch away, use a pencil, use a crayon, sit still for a story...well you get the idea. Was this difficult? You bet! The language arts program I was using spent the first half of the year teaching the children letters and sounds and the second half of the year teaching word families and other sound patterns such as sh, th, ng, etc... Sound a bit much for 5 year old's? Of course it does! It was! The higher achieving students could keep up, but no one else. At the end of the year, I was expected to test these children and they were expected to actually read a book. To add insult to injury, this particular book had words with patterns in it that are not covered until 1st grade. But yet, they were still expected to read it or they were not on grade level. Oh yeah, that makes perfect sense! So here we are back to the same thing. School systems are expecting infants to walk. This has turned into a huge epidemic. The powers that be love to say that it's all about the children, but it isn't. It's all about the competition. Until the competition is removed from the equation it will never be about the children. And how sad that is. 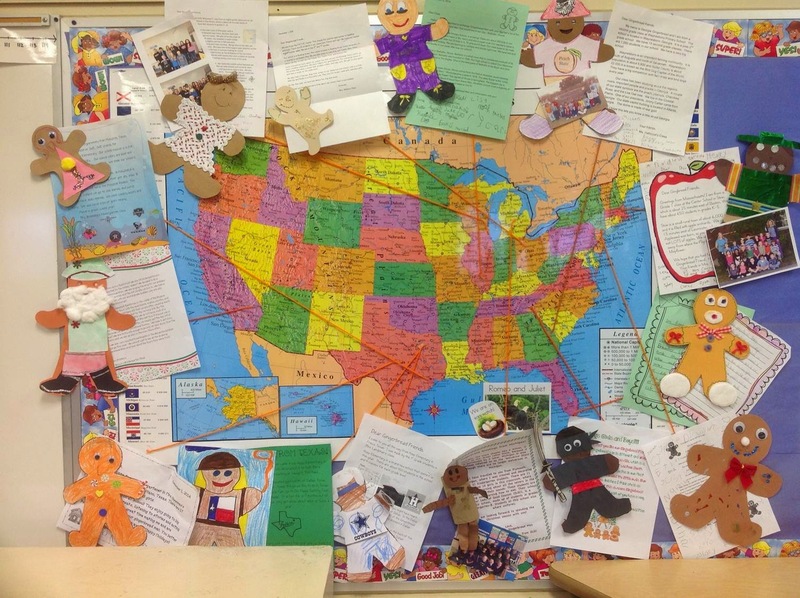 My class has finished participating in this year's Gingerbread Man Exchange and it was a great success! The kids loved it! The anticipation, each day, was tremendous! 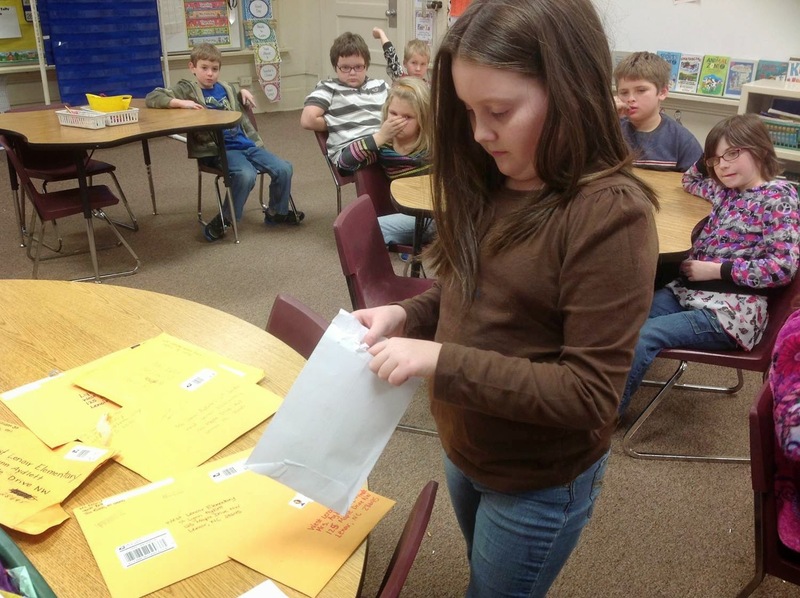 My students could not wait until the mailman dropped off the mail at our school. Usually we would receive 1-2 letters at a time, but one day we actually received 7! Talk about memorable! A big thank you to Pawsitively Teaching for organizing this wonderful activity for my class! They really enjoyed learning about children and their homes. The gingerbread men were adorable! It was a lot of fun! Below you will see a pictures of our class opening up our letters and the map we created with all our little gingerbread men. 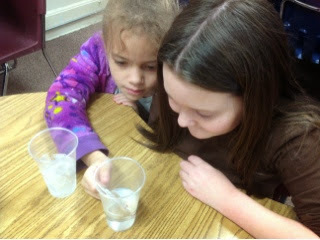 Today, my students used thermometers to measure the temperature of cold icy water and hot water. You would have thought I had given them a million dollars and the run of the world's largest toy store because all I heard was "Can we do this tomorrow?" and "Can we do this everyday?" It was so simple, but it was so fun! 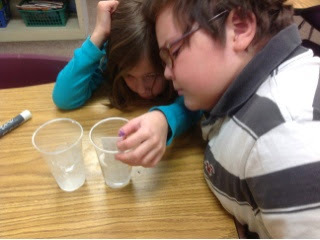 They love experiments and hand on activities. So maybe I should try some more advanced activities...hmmm. As I get older, I find myself wanting everything in my life to be simpler. I also want more time. I dislike wasting time and I resent someone else wasting my time. Most recently, I started cleaning out my email account. There are too many wasted emails in my inbox. I unsubscribed to at least thirty companies in one night and spammed just as many. It wastes time going through tons of non-relevant emails day in and day out. It felt so wonderful to open my email the next day and have it less full! Unless I order from a company regularly, I don't need it! The same can be said for my work activities. 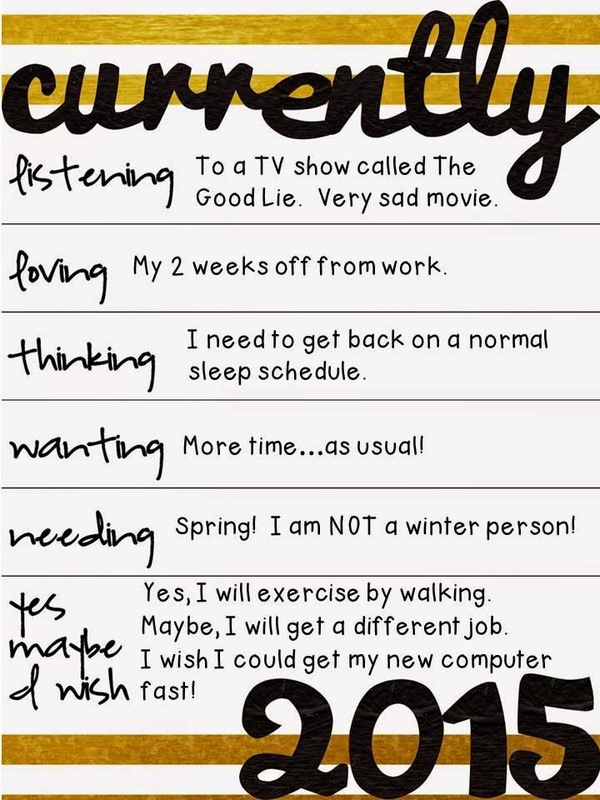 I want my day to be simple. I want my time to be well spent. 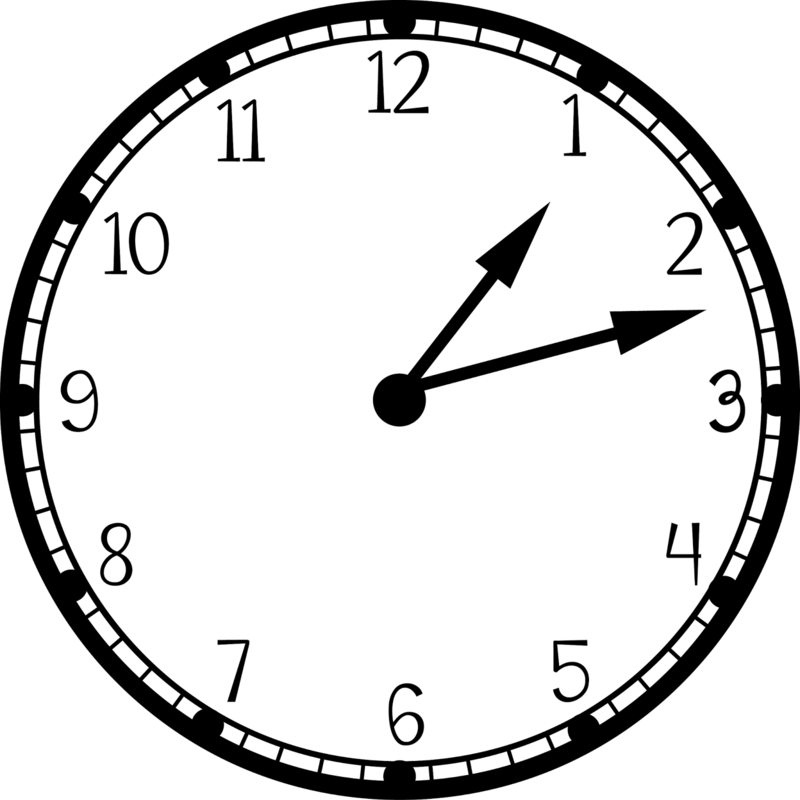 My students have heard me say, many times, don't waste your minutes! The value of their time is just as important as mine. If your work is finished, get a book to read and focus on it. I will do the same. I have five minutes to spare, then I can grade five minutes worth of papers or cut five minutes worth of laminating. Five minutes here, five minutes there...it really adds up! When someone says, "How did you get that done?" I just say, "I don't waste my time." There are tons of apps that can be downloaded and used in the classroom. 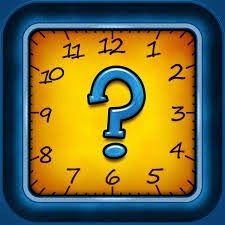 One of my favorites is the Telling Time Quiz. Used independently, or in a group setting, it can be very motivational and a great daily or weekly practice for your students. 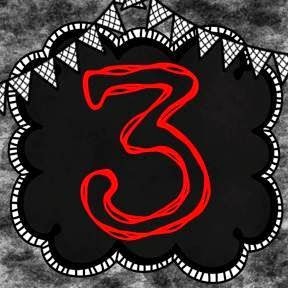 When locating the app, look for the picture shown above. It's free! My favorite way to use this app is with the whole class. I place the Ipad under the document camera so the kids can see it on the screen. They line up and off we go! The goal is to beat each level. Watch the video below to see the action. The librarian and guidance counselor at my school came up with the most adorable idea for a library Christmas tree and I just love it! They are old encyclopedias and maybe a dictionary or two thrown in. 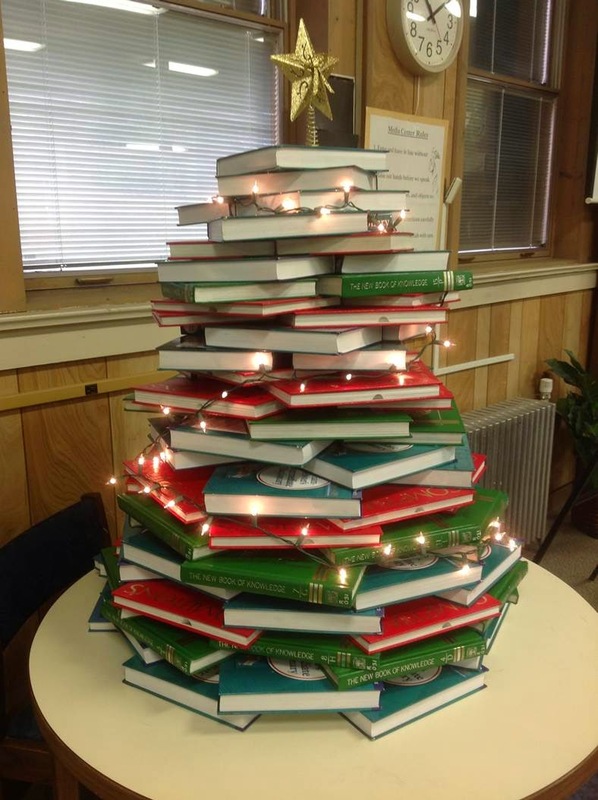 As string of lights and a star on top and you have the perfect Christmas tree for any library! 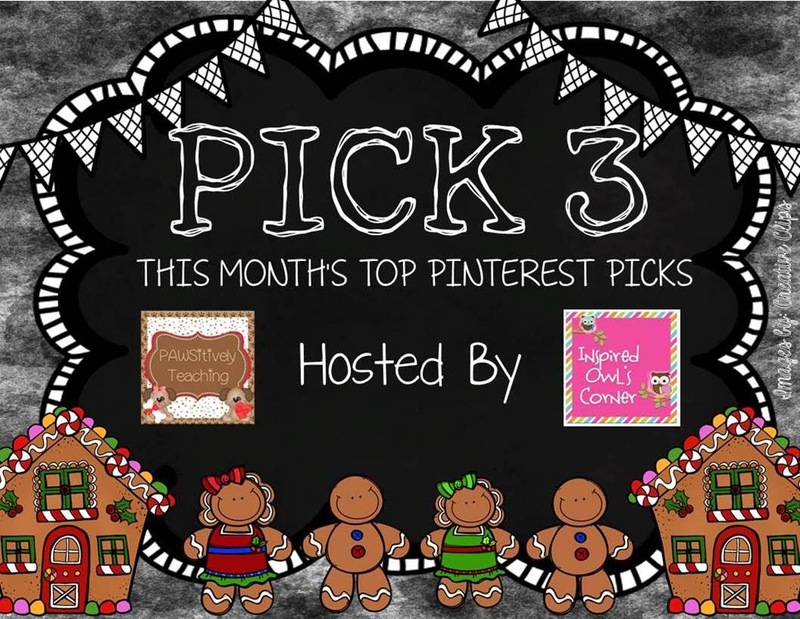 I am so excited to have joined some fellow bloggers in a monthly pick 3! 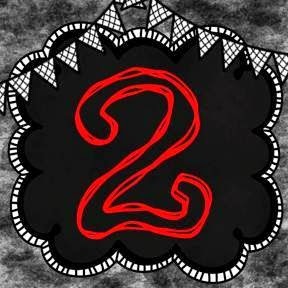 Each month, on the 3rd day, we will be highlighting some wonderful Pinterest ideas that we can use in our classroom! 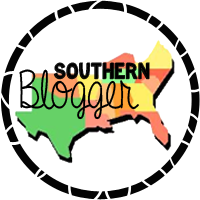 So come join us each month and check out some great ideas! I love Christmas time! And despite the busy time of the year, I still try to fit in as much holiday activities and fun in my classroom as I can. The Christmas tree made out of strips of paper! I have actually done this activity before and the kids loved it! I used a variety of paper strips, but if you want to add a math twist to it have the children measure out each strip to a desired amount! I love, love, love this writing activity! My students groan when it is writing time, so I am always looking for new and fun ways to liven it up for them! 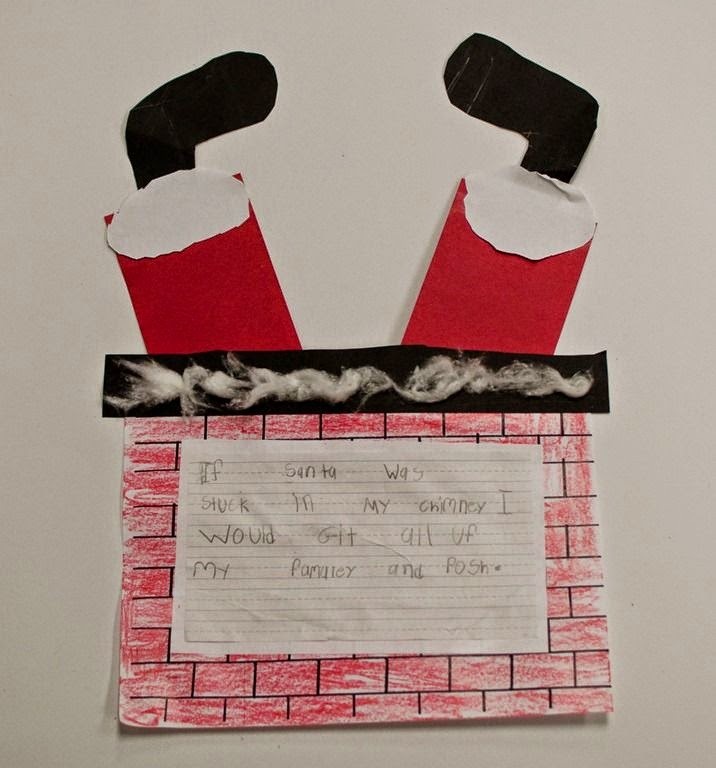 What child wouldn't want to write about Santa getting stuck in the chimney? 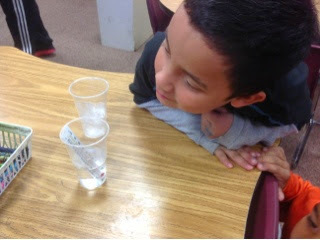 I don't know about you, but I don't do enough Science experiments in my classroom! This is sure to be a hit and I am excited to try it out! 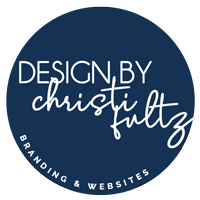 If you are looking for other great ideas, check out my pinterest boards!